Creating genuine and controllable guitar feedback has always presented a challenge, and few pedal or plug-in designers have taken it on. Boss got in early with their Distortion/Feedback pedal, which faked feedback by tracking the guitar’s pitch and using it to control an oscillator when the pedal was stepped on. A little fixed LFO vibrato was added along with a suitable harmonic structure to make it sound reasonably convincing, but the main problem was that you couldn’t bend or add natural vibrato to the feedback sound as it all came from the oscillator. A few years later they tried again with the FB-2 Feedback Booster, this time using a tracking filter to boost frequencies around the last note played. This produced somewhat more natural-sounding results but still didn’t quite nail the real thing. Softube did pretty well with their Acoustic Feedback plug-in, but it’s obviously rather trickier to use on stage than a pedal. Digitech’s approach is even more sophisticated: to simplify a little, they use feedback-suppression technology in reverse, to amplify feedback rather than suppress it. The result is a very natural-sounding feedback that behaves much as a loudly played guitar would when feeding back, but with the benefit that you can select which harmonics make up the feedback tone and how quickly they build up. For a special effect, you can kill the dry sound completely. All this comes in a compact pedal, which requires a standard 9V DC PSU (a suitable one is available as a cost option). The footswitch triggers the effect and can be set to latching or momentary action; momentary is probably the best bet for bringing in feedback during a performance. This mode also offers a hard-wired bypass, whereas in latching mode the bypass is buffered. Take your foot off the pedal in momentary mode and the guitar’s behaviour returns to normal. A long line of red LEDs displays the feedback intensity. The rate of feedback build-up is controlled by the Onset knob and its level relative to the guitar sound by the Gain section of the dual-concentric pot. The Dry switch kills the dry sound. A seven-position rotary Type switch selects from one of seven feedback harmonic types, and that’s about it — there’s really nothing difficult for users to get their heads around. The seven ‘types’ are made up of sub-octave, first harmonic, second harmonic, third harmonic, fifth harmonic, Natural Low and Natural High. According to the manual, these last two modes act more like natural feedback does, and they may well produce different feedback harmonics every time you play the same note. These settings also respond to pickup choice and guitar tone-control settings. 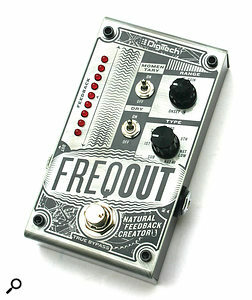 I think Digitech really have cracked this one — the feedback effects sound and feel very natural, even when playing at very low volumes. For best results the FreqOut should go at the front of your effects chain, though it would also probably be quite happy placed after a compressor or buffer. It’s sometimes necessary to damp unwanted strings to avoid spurious sounds when sustaining a single note, just as it is when controlling real feedback. And, as with the real thing, the results with chords are less predictable than with single notes. By killing the dry sound, it’s possible to play sustained melodies much as you might with an eBow, except that you can’t vary the harmonics during performance (something you can do by changing where you place the eBow relative to the pickups). Nonetheless, it’s a useful effect, not unlike a monophonic version of the Sustainer guitar, and some reverb and/or delay really brings it to life. Whether you need this pedal or not rather depends on your musical style, but already I can envision making a lot of use of it in the studio as well as at gigs. Those Gary Moore-style endless sustained notes are so easy to coax from the guitar at any volume while more esoteric sounds can be created by using the feedback sound itself as a musical instrument.